Huckleberry compote adds a tart bite to Wild Sage's Wild Berry Panna Cotta. Although this year's weather turned quickly on the heels of huckleberry season, the regional favorite typically abounds through the early fall, when most other regional berries — blackberries, strawberries and raspberries — have long since become part of your frozen cache, or a distant memory of summer. In establishments at the height of their craft or bearing, chefs therefore are particular about whether fresh or frozen are acceptable, disqualifying some berries for use in all but fresh dishes. Though they're difficult to propagate — they require "ericoid mycorrhizal fungi and fire disturbance," according to Native Plant Society sages — the region's famous purple berry freezes well and resists mushiness upon thawing. Despite their tart reputation, huckleberries complement a wide range of dishes. It isn't the huckleberry vodka in this libation that puts you in a special place; it's the bittersweet bite of huckleberry honey and orange bitters. A splash of fresh grapefruit and you've got the perfect counterpart to your evening in the shoulder season — the time between the heady bloom of summer and the chilly descent of autumn. The huckleberry honey in the vinaigrette is from Idaho, the cheddar cheese is from Oregon, and the apples — usually Granny Smith — are from Washington in this healthful way to honor the bounty of our region. "Huckleberries are a staple ingredient of the Tribe, and we constantly look for new and unique ways to incorporate them into our menu," says Coeur d'Alene Casino Executive Chef Steven Walk. When he was first promoted to executive chef in 1986, the Coeur d'Alene Resort's Rod Jessick wanted to showcase local products: St. Maries wild rice, local legumes and huckleberries he remembered picking as a youth. "My mother made a wonderful homemade huckleberry pie with sugar, fresh lemon juice, a light touch of cinnamon, with tapioca and a touch of flour as thickener," Jessick recalls. "The lemon gives the pie a fresh taste and balances the flavors, so my mom would tell me." Fast-forward 30 years, and Jessick figures the Resort was storing more than $20,000 worth of huckleberries in special freezers for such dishes as milkshakes, cobblers and pies. Huckleberries even were prominent in the plans for former executive pastry chef Jim Barrett's national contest entry for low-fat bran muffins (he took second place). Current executive pastry chef Debbie Hime reports that each cobbler has between 1½ and 1¾ cups of huckleberries, so as long as those freezers are getting electricity, there'll be many opportunities to enjoy huckleberry desserts at the Resort. Bonus: They also have a gluten-free version! "The inspiration for the pork cassonade dish came by happenstance during a discussion with a former cook on fusion and local ingredients," explains Thane Jenness, Trinity at City Beach's executive chef. The dish combines an Italian pork scallopine — thin cutlets — with a French brown sugar called cassonade. Artichoke hearts, mushrooms, tomatoes, huckleberries and cream round out the dish, which combines savory and sweet for a hearty fall meal. 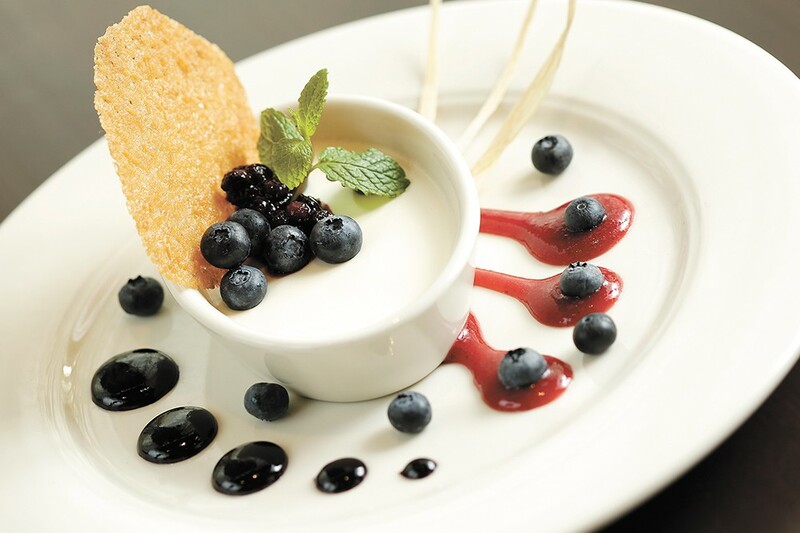 Though it was intended for summer dining, Wild Sage Executive Chef Charlie Connor found that the restaurant's Wild Berry Panna Cotta was popular year-round.